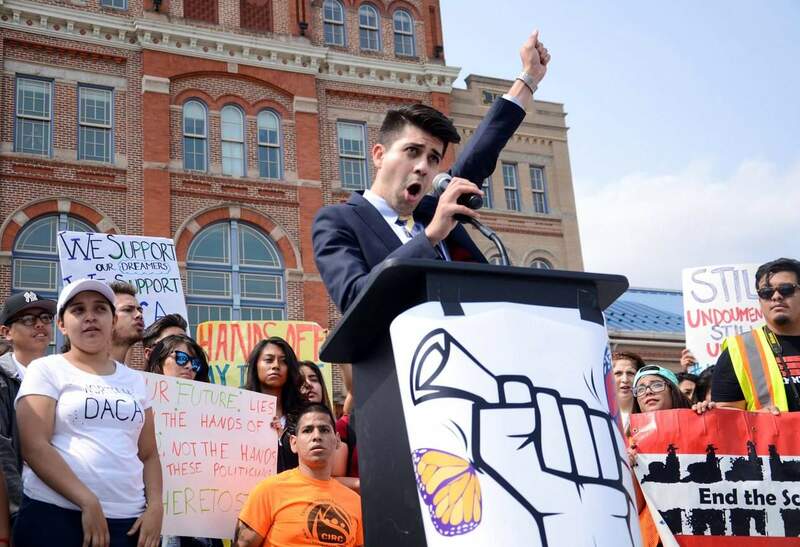 Christian Salano-Cordova, communications manager at the Colorado Immigrant Rights Coalition, speaks at a rally at Metropolitan State University in Denver on Tuesday. Demonstrators converged on the campus after President Donald Trump’s decision to repeal a program protecting young immigrants from deportation. Colorado Sens. Michael Bennet and Cory Gardner on Tuesday signed on as co-sponsors of the DREAM Act of 2017 after President Donald Trump announced he would phase out a program that shields young immigrants from deportation. Gardner’s support for the act is a shift for the Republican when it comes to immigration. In 2013, Gardner voted to block President Barack Obama’s program Deferred Action for Childhood Arrivals, or DACA. During his re-election bid in 2014, the senator made immigration reform a major part of his platform. “Allowing passage of such a policy was avoiding the real problem,” Gardner told Congress in 2013. The next year, Gardner switched his position when he voted against a Republican-led effort to end DACA. Trump said he will halt applications for the DACA program. Attorney General Jeff Sessions declared the Obama administration’s program “an unconstitutional exercise of authority” that must be revoked. But the administration is giving Congress six months to come up with a legislative fix – “should it choose to,” Sessions said – before the government stops renewing permits for people already covered by the program. The DREAM Act of 2017 proposes that young immigrants in the country illegally, known as Dreamers, receive conditional permanent residence followed by legal permanent status if they arrive in the U.S. before they are 18 years old; graduate from high school or obtain a GED; pursue higher education; work lawfully for at least three years or serve in the military; pass security checks; and demonstrate proficiency in English and a knowledge of U.S. history. There are an estimated 17,000 residents in Colorado enrolled in DACA; in the U.S. the estimate is 800,000. Bennet co-sponsored the DREAM Act of 2010 and was a member of the bipartisan “Gang of Eight,” which created the bill in 2013 for comprehensive immigration reform. The bill passed the Senate but was not considered by the House.